I never read Ann Brashares’ The Sisterhood of the Traveling Pants (or its sequels), but one of my very best college friends read them all in high school, and she used to talk about the characters and stories like they were real people who could be right in the room with us. I knew Brashares’ writing had to be good to pull my friend in, but I never felt an urge to try that series myself. Instead, it took a beautiful book cover and a science fiction premise to hook me. 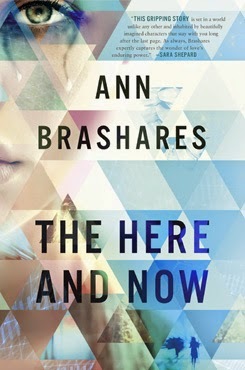 Once in, I finished The Here and Now in short order, and I think I understand a little of my friend’s obsession. Despite appearances, Prenna James is not your average teen. In fact, she’s not even from this time. What, then, is she? A fugitive from a not-so-distant future wracked with plagues and catastrophe, where fear rules and death is as close as a mosquito bite. Now that she and a select few have made it to the past, they live by a strict code that protects the community. The problem is that Prenna can no longer pretend to like living under the rules, or understand their necessity. She has questions, important ones. What does the date May 17, 2014 mean? What is her classmate Ethan forever trying to tell her? What is the deal with that old homeless man in the park? Her search for answers has the potential to turn both of her worlds on their heads. In Prenna, Brashares has created a stubborn, smart, and curious teen chafing under a set of rules that kill her a little more each day. Her bleak, isolated life is all she knows, but new high school experiences, memory and an almost unshakeable, albeit deeply buried, hope add up to something worth challenging the status quo for. Prenna’s society is sinister, isolationist, and Big Brother-esque, but the immense interest in Prenna’s everyday doings at times seemed over the top. If the reader can suspend disbelief and buy-in, it’s certainly a chilling future. I myself wavered a bit here and there, but overall I appreciated the execution and the air of suspicion and menace that tainted Prenna’s entire experience. Of course, this isn’t just a tale of time travel and the eventual end of the world. It’s also a story of a magnetic attraction between Prenna and her classmate Ethan. But the rules that govern Prenna cover outsiders’ knowledge of the time travelers as well as intimacy with time natives, so everything is forbidden. Since the story is told from Prenna’s point of view, it includes her musings and insecurities on petty (and more serious) concerns, including her suspicions about the abuse of power within her own community and the real reasons for the rules they must all live by. Lying here like this, I can imagine happiness. Not a kicky, bright kind, but a full, almost aching kind, both dark and light. I can see the whole world in this way. I can imagine extending the feeling to other places and parts of the day. I can imagine holding it in my pocket like a lens, and bringing it out so that I can look through it and remember again and again the world that has this feeling in it. Prenna is a heroine with real baggage and sorrow for memories. Hers is not a light story, but it makes for quick quality reading. Recommended for: fans of Neal Shusterman's Unwind, Rick Yancey’s The Fifth Wave, Cory Doctorow’s Little Brother, and anyone interested in young adult sci-fi and dystopian lit. Fine print: I received an advance copy of this book from the publisher for honest review. I did not receive any compensation for this post. I JUST checked this out from the library on Thursday, and it's sitting on my table waiting for me to pick up. I'm so glad you did this review, now I'm even more motivated to read it. And, like you, I picked this up while pondering picking up the Sisterhood series because I also have a friend with good taste in books that loves it. Can't wait to start it now! I enjoyed this one quite a bit. I wish it had done more with the time travel, but that wasn't the story the book wanted to tell, and that's fine. I never read the Traveling Pants books, either, but I have read My Name Is Memory and really enjoyed it. So I might like this one. *sigh* Another book for the TBR pile!